Bennet in a 1986 photo. Douglas Bennet Jr., a former NPR president who led the network following its most severe financial crisis, died Sunday. He was 79. Bennet’s death was announced in a joint statement by his three children: Colorado Sen. Michael Bennet, whose office released the statement; James Bennet, editorial page editor for The New York Times; and Holly Bennet. The family did not disclose a cause of death. Bennet began his leadership as NPR’s president in 1983 after a long political career that included two years running the U.S. Agency for International Development and serving as the first staff director of the Senate Budget Committee. “Doug was very sharp, very bright … and was very wise about Capitol Hill,” Robert Siegel, who as NPR’s news director worked under Bennet, told NPR. When Bennet signed on to lead NPR, the network was just beginning to recover from a financial crisis and had secured a $7 million loan from CPB. 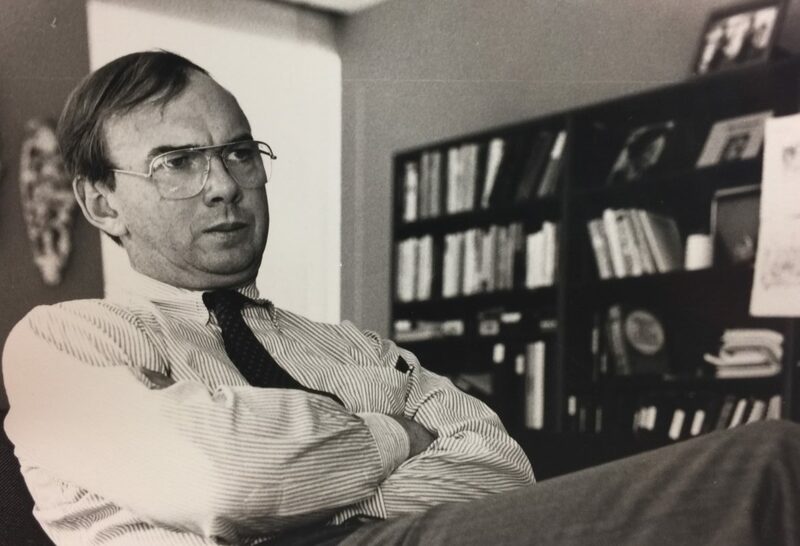 Though Bennet knew little about public radio before joining NPR, he was able to provide stability, according to Jack Mitchell, author of Listener Supported: The Culture and History of Public Radio and a chair of NPR’s board during Bennet’s tenure. In an interview, Mitchell described Bennet as a formal person with a “big voice” and “stentorian way of speaking” that contrasted with NPR’s informal atmosphere. “He didn’t exactly fit in with the rest of the staff,” Mitchell said, but he gave NPR “a certain formality and a certain dignity,” Mitchell said. Bennet quickly got NPR’s financial status in order and “brought financial stability to the organization that had never really been there before,” Mitchell said. “He was absolutely what was needed at the time,” Mitchell said. During his tenure, Bennet also oversaw NPR’s transition from receiving direct financial support from CPB to the current system, in which CPB supports NPR’s member stations. Bennet “thought that a collaboration with NPR and the stations would serve their mutual interests,” Mitchell said. In 1989, his name was used in an April Fools’ Day segment by Scott Simon, who told listeners about a fictitious company named Doug Be’net. Bennet left NPR in 1993 upon being appointed assistant Secretary of State for international organization affairs by President Bill Clinton. Following Bennet’s departure, CPB’s board passed a resolution recognizing him “for his astute management and administrative skills in restoring financial stability to NPR,” among other achievements during his tenure. Bennet went on to be president of Wesleyan University from 1995–2007. In addition to his three children, he is survived by his wife, Midge, according to NPR.